E. Trapl. School-Based Retail Environment Exposures and Youth Cigarette, Cigar, and e-Cigarette Use. February 2019. Society for Research on Nicotine & Tobacco Annual Meeting. San Francisco, CA. Flocke, S.A., Antognoli, E., Ishler, K., Lim, R., Cavallo, D., Pagano, M., Koopman Gonzalez, S., Trapl, E.S. Association of Nicotine Dependence with Groups of Multiple Tobacco Product Use Among Adolescent and Young Adult Cigarillo Users. Oral presentation. Society for Research of Nicotine and Tobacco. Baltimore, MD, February 2018. Susan Flocke*, Erika Trapl, Elizabeth Antognoli, Rock Lim, Sarah Koopman Gonzalez, David Cavallo, Maria Pagano, José Marino. Measuring Nicotine Dependence among Adolescent and Young Adult Cigarillo and Multiple Tobacco Product Users. Oral presentation. Society for Research of Nicotine and Tobacco. Baltimore, MD. February 2018. Implementing a Produce Prescription Program for Hypertensive Patients in Safety Net Clinics. Kakul Joshi. Population & Quantitative Health Science Departmental Seminar, Case Western Reserve University. February 19, 2018. Using Design Sensitivity to Select between Competing Matched Sampling Algorithms in an Observational Study. David Ngendahimana*. Population & Quantitative Health Science Departmental Seminar, Case Western Reserve University. February 19, 2018. Pass the khat: Bar groups, reciprocity and men’s HIV vulnerability in Kampala, Uganda. Megan Schmidt Sane. Society for Applied Anthropology's Annual Meeting, Philadelphia, PA. April 6, 2018. Flocke S, Trapl E, Antognoli E, Lim R, Koopman Gonzalez S, Cavallo D, Pagano M, Marino J. Measuring nicotine dependence among adolescent and young adult cigarillo and multiple tobacco product user. Poster presentation. February 2018. Society for Research on Nicotine and Tobacco. Baltimore, MD. Hardin, HIK; Jones, S; Sattar, A; Liu, J; Plow, M; Moore, S; Borawski, E. Does focus and content of family rules matter? Poster. Sept 2018. Council for the Advancement of Nursing Science, Washington, DC. Erika Trapl. Breathe free: Partnering with 2-1-1 to increase smoking cessation among low income smokers. Poster. Dec 2018. 11th Annual Conference on the Science of Dissemination and Implementation, Washington, DC. Dominique Rose, M.Ed., CHES, and Aaron Diehr, PhD, CHES Spatial Analysis of Opioid Overdose Deaths in Illinois, 2013-2016. 2018 APHA annual meeting. San Diego, CA. Trapl ES, Klein E, Keating M, Quisenberry A. Diversity of cigarillo packaging designs and visual attention to package images. February 2018. Society for Research on Nicotine and Tobacco. Baltimore, MD. Cigarettes, Little Cigars, and Cigarillos: Initiation, Motivation, and Decision Making. Elizabeth Antognoli, Sarah Koopman-Gonzalez, Erika Trapl, David Cavallo, Rock Lim, Susan Flocke. February 2018. Society for Research on Nicotine and Tobacco. Baltimore, MD. Antognoli, E, Ishler K, Flocke S, Lim R, Cavallo D, Pagano M, Koopman Gonzalez S, Trapl E. Association of nicotine dependence with groups of multiple tobacco product use among adolescent and young adult cigarillo users. February 2018. Society for Research on Nicotine and Tobacco. Baltimore, MD. Trapl ES, Koopman Gonzalez S, Flocke S. Nicotine dependence among adolescent smokers: Application of a brief, product-neutral dependence measure. February 2018. Society for Research on Nicotine and Tobacco. Baltimore, MD. Koopman Gonzalez, Marino J, Ishler K, Trapl E, Antognoli E, Lim R, Cavallo D, Pagano M, Flocke S. Love at first puff: Positive first experience of cigarillo use. February 2018. Society for Research on Nicotine and Tobacco. Baltimore, MD. Lim R, Ishler K, Antognoli E, Cavallo D, Marino J, Koopman Gonzalez S, Pagano M, Trapl E, Flocke S. “Phantom Smokers”: Smoker identity among teen and young adult users of cigar products. February 2018. Society for Research on Nicotine and Tobacco. Baltimore, MD. Trapl ES, Anesetti-Rothermel A, Pike S*. School-based retail environment exposures and adolescent youth cigar, cigarillo and little cigar use. Poster presentation. February 2018. Society for Research on Nicotine and Tobacco. Baltimore, MD. Karen Ishler*, Elizabeth Antognoli, Erika Trapl, Rock Lim, Susan Flocke. A Comparison of Methods to Measure Consumption of Tobacco Products Among Adolescent and Young Adult Cigarillo Users. February 2018. Society for Research on Nicotine and Tobacco. Baltimore, MD. Allison Schlosser, MSW, MA; Kakul Joshi, MPH; Samantha Smith, MA; Anna Thornton, MPH; Shari Bolen, MD, MPH; and Erika S. Trapl, PhD. “The coupons and stuff just made it possible”: Economic constraints and patient experiences of a produce prescription program. November 2017. American Public Health Association Annual Meeting, Atlanta, GA.
Anna Adachi-Mejia; Kerstin M. Reinschmidt; Abby Lohr; Elaine A. Borawski; Stephanie Kelly, and Miruna Petrescu-Prahova. Community-clinical linkage projects across the Prevention Research Center network: Strategies and lessons learned. November 2017. American Public Health Association Annual Meeting, Atlanta, GA.
Matthew Kucmanic, MA, MPH; Laura Santurri, PhD, MPH, CPH; Aaron Goldenberg, PhD, MPH; and Scott Frank, MD, MS. Precision Medicine Paradox of Public Health: A Qualitative Understanding of Public Health Professionals' Opinions. November 2017. American Public Health Association Annual Meeting, Atlanta, GA.
Morgan Taggart; Jennifer Scofield; Najah Muhammad; Lena Grafton; and Elaine A. Borawski. Shared Ownership in Community Academic Partnerships and Their Impact on Public Health. Oral panel. 2017 APHA Atlanta, GA. November 2017. Flocke, SA, Seeholzer E, Lewis S, Ordillas E, Gill I, Birkby G. A systems-based role change within safety net clinics to address provision of tobacco cessation care. Dec-17. Science of Dissemination & Implementation in Health. Arlington, Virginia. Carissa Smock, Lynn Falletta, Matthew Nichols, Peter Leahy, Ken Slenkovich. Lessons learned from a multi-hospital Community Health Needs Assessment: Methods for moving forward. Roundtable presentation. American Public Health Association Annual Meeting. Atlanta, GA. November 2017. Kakul Joshi, Briana McIntosh, Jennifer Roberts. Expanding Healthy Retail Opportunities through Community Involvement: Good Food Here store owner guides	Cleveland Clinic, Tubbs-Jones Center. March 2017. Koopman Gonzalez, Sarah; Trapl, Erika; & Metz, Emily. “Am I Helping or Enabling?”: Harm Reduction, Ethics, and the Balance of Risks in Pharmacists’ Attitudes and Behaviors Regarding Non-Prescription Syringe Sales. Society for Applied Anthropology Annual Meeting, Oral Presentation. March 30, 2017. Kakul Joshi. Produce prescriptions for food insecure patients with hypertension in safety net clinics: a clinical-community linkage. March 27, 2017, Case School of Medicine, E501 Seminar. Cleveland, OH. Stephanie Pike Moore. Examining Food Retail Choice Contexts in Urban Food Deserts. March 27, 2017, Case School of Medicine, E501 Seminar. Cleveland, OH. Darcy Freedman, PhD. Evaluating a Food Environment: Natural Experiment Designed to Improve Healthy Food Access and Diet. John Glenn School of Public Affairs Colloquium Series (The Ohio State University). April 3, 2017. Columbus, OH. Baily, H; Monteban, M; Walsh, C; Freedman, D; and Matlack, K. (2017, April). Elucidating social network strategies to expand the scope of nutrition education. 2017 Society for Applied Anthropology Annual Meeting. March 2017. Santa Fe, NM. Erika Trapl, PhD, American Cancer Society's Cancer Action Network (ACS CAN) Leadership Volunteer meeting. April 15, 2017, Columbus, OH. Sue Flocke, PhD. Addressing Tobacco Cessation in the Primary Care Setting: Opportunities and Evidence-based Strategies (keynote). Tobacco-Related Cancer: Prevention and Care. April 21, 2017, Oregon Prevention Research Center at Oregon Health & Science University. Zeliadt S, Birkby G, Hoffman R, Eberth J, Park H, Reuland D, Tynell-Brenner A, Flocke SA. Implementation of Lung Cancer Screening among Federally Qualified Health Centers (FQHCs) in the U.S. American Society of Preventive Oncology. March 2017, Seattle Washington. Bailey, Heather; Walsh, Colleen M; FreshLink Ambassadors: Peer Support to Increase Use of Farmers’ Markets among SNAP Recipients. Expanded Food and Nutrition Education Program (EFNEP) Conference, May 10, 2017. Columbus, OH. Erika Hood. Safe Routes to School National Partnership and National Shared Use Task Force webinar. July 20, 2017. Darcy Freedman, PhD, invited testimony on SNAP-Ed and nutrition incentive programming, Bipartisan Policy Center SNAP Task Force meeting. Sept. 15, 2017. The task force took recommendations that emerged from the National Commission on Hunger commissioned by Congress in the 2014 Farm Bill and made recommendations for policy targets for the next Farm Bill planned for approval in 2018. Darcy Freedman, PhD. Developing a Peer-to-Peer Dissemination Intervention to Promote Social Access to Farmers’ Markets among Low-income Populations in Ohio. Part of a cross-PRC panel presentation titled Understanding the Role of Community Health Workers in Addressing the Social Determinants of Health. Interdisciplinary Association for Population Health Science conference. October 2-4, 2017, Austin, TX. Carissa Smock, Sonia Alemagno, Lynn Falletta, Jeffrey Hallam, Jonathan VanGeest (2017). Predictors of health care provider place-based exercise referral. North Coast Conference on Precision Medicine. Cleveland Ohio, Case Western Reserve University. Jones SD, Thomas A, Trapl ES, Borawski EA. 2017. Environmental Influence on Diet and Diet Quality of Overweight and Obese Urban Youth. ObesityWeek, Washington, DC, October 31. Stephanie Pike Moore, MPH.New Approaches to Evaluating the Food Environment & Interventions. November 17, 2017. Case Western Reserve University Public Health Innovations Conference. Cleveland, Ohio. Sarah Jones, PhD Candidate, presented "The Environmental Influence on Diet of Overweight and Obese Urban Youth" on November 27, 2017, as part of the Population & Quantitative Health Sciences (PQHS) Departmental Seminar series. Joshi K, Smith S, Osborne A, Thornton A, Mcintosh B, Hoch C, Hood E, Embry M, Benko M, Trapl E. Produce Prescriptions for Food Insecure Patients with Hypertension in Safety Net Clinics: A Clinical-Community Linkage. American Academy of Health Behaviors. March 21, 2017. Tucson, AZ. Borawski E, Bottoms L, Taggart M, Debose N, Pike S, Joshi K, Freedman D, Trapl E. Fresh Produce for All: Results of a Community-Wide Initiative to Increase Access to Fresh Produce in Cleveland. American Academy of Health Behaviors. March 21, 2017. Tucson, AZ. Flocke, SA, Seeholzer E, Lewis S, Ordillas E, Gill I, Birkby G. A systems-based role change within safety net clinics to address provision of tobacco cessation care. 17-Dec poster presentation Science of Dissemination & Implementation in Health Arlington, Virginia. Examining dynamism within food retail choice contexts when evaluating food environment interventions. Stephanie Pike Moore, MPH . Pathways to Prevention Workshop, Methods for Evaluating Natural Experiments in Obesity, December 5–6, 2017. National Institutes of Health Office of Disease Prevention. Bethesda, Maryland. Appropriateness of intravenous vancomycin dosing and monitoring at a large academic medical center. Paola Saroufim, Pharm. D., MPH candidate; Riane Ghamrawi, Pharm.D., BCPS; Jason Makii, Pharm.D., BCPS; Andreea Popa, Pharm.D., BCPS; and Scott Frank, MD, MS. November 2017. American Public Health Association Annual Meeting, Atlanta, GA.
PRCHN faculty, staff, and students presented a total of 12 posters at the Research ShowCASE in April 2017. Click here to see the full list of all PRCHN posters at Research ShowCASE. Sarah Drewes Jones’s poster “The Environmental Influence on Diet and Diet Quality of Overweight and Obese Urban Youth” received an honorable mention in CWRU’s annual Research ShowCASE. Lessons learned from a multi-hospital Community Health Needs Assessment: Methods for moving forward. Carissa Smock, MPH, PhD; Lynn Falletta, PhD; Matthew Nichols, MPH; Peter Leahy, PhD; and Ken Slenkovich, MA. November 2017. American Public Health Association Annual Meeting, Atlanta, GA. Measuring progress towards national goals: A Data Dashboard for the Bike Advocacy Community of Cleveland. Anna Thornton, MPH; Audrey Kinsella, MPH; Barb Clint, BA; Jacob Van Sickle, BA; Patricia Terstenyak, MPH; and Elaine A. Borawski, PhD. November 2017. American Public Health Association Annual Meeting, Atlanta, GA. Score it but will they come? STAT: A spatiotemporal tool to link trail quality and use. Carissa Smock, MPH, PhD; Naomi Carlson, BS; and Matthew Nichols, MPH. November 2017. American Public Health Association Annual Meeting, Atlanta, GA.
Health Data Visualization Using Virtual Reality. Rashon Braxton, MPH student and Scott Frank, MD, MS. November 2017. American Public Health Association Annual Meeting, Atlanta, GA.
Walsh, C., Baily, H.,Monteban, M., Freedman, D., Jennings, E., Matlack, K. Everything that's good for you is jacked up high: Social, cultural and economic meanings of and constraints to 'eating right.' American Anthropological Association Annual Meeting. Minneapolis, MN. December 2016. Erika Hood, Maleka Embry, Briana McIntosh. Community Voices: Creating Greater Destinies. Health Improvement Partnership-Cuyahoga Consortium Meeting. 30 November 2016. Cleveland, OH. Scott Frank, Amy Sheon, Ayanna Smith, Becky Gawelek, Rashon Braxton. Health Data Matters: Lessons from development and implementation of a local open health data resource. American Public Health Association Confererence. October 2016. Denver, CO.
Darcy Freedman, Katie Merritt, En-Jung Shon,Emily Jennings, Julia Pon, Alan Hunt. Adoption of Technology to Evaluate Nutrition Incentive Programs at Direct-to-Consumer Markets throughout the United States. American Public Health Association Annual Meeting. Denver, CO. November 2016. Amy Sheon, Scott Frank, Matthew Kucmanic, Melissa Simon, Chris Kippes. Bringing innovation to public health: Adding a public health perspective to a medical hackathon. American Public Health Association Confererence. October 2016. Denver, CO.
Freedman, D. Presenter. Greater Cleveland Foodbank Health Communities, Healthy Families Conference. 19 August 2016. Cleveland, OH. Trapl, E. Farmers' markets as a public health strategy. Society for Public Health Education. August 11, 2016. national webinar. Lee, E; Ngendahimana, D; Olaisen, H; Dalton, J; Bebo, P; Davis, AS; Freedman, D. Developing consensus-based models of readiness and capacity for implementing farmers' market interventions. Innovations in Collaborative Modeling Conference. June 2016. East Lansing, MI. Jewett, J; Collins, C; Matloud, J; Borawski, E. Lifting all boats: Increasing community organization research capacity and community-engaged scholar through a community/academic research partnership program. Advancing the Science of Community Engaged Research. August 2016. Washington, DC. Trapl, E. Sale of flavored tobacco products. Cleveland City Council Health & Human Services Committee. January 2016. Cleveland, OH. Trapl, E. Update on Breathe Free CLE. Cleveland City Council Health & Human Services Committee. March 2016. Cleveland, OH. Trapl, E. Nobody smokes them regularly: Cigar, Cigarillo, and Little Cigar Use among Youth and Young Adults. University of Maryland School of Public Health Collegium of Scholars. 4 May 2016. College Park, MD. Freedman, D. Preliminary data from FreshLink study. Convening meeting for building a statewide healthy food incentive network, Columbus, OH. March 2016. Cascio, A; Lee, E; Vaudrin, N; Freedman, D. Building Consensus while Building Capacity for Obesity Prevention: A System for Reaching Inter-Coder Consensus in Applied Qualitative Research. Society for Applied Anthropology, Vancouver, BC, Canada. March 2016. Trapl, E.S. Characteristics and Concurrent Substance Use Behaviors of High School Youth Who “Freak” Cigars, Cigarillos and Little Cigars. Society for Research on Nicotine and Tobacco, Chicago, IL. March 2016. Trapl, E. Sale of flavored tobacco products. Cleveland City Council Health & Human Services Committee, Cleveland, OH. January 2016. Stephanie Pike, Erika S. Trapl, Jill Clark, Chaturia Rouse, Ashwini Sehgal, Elaine A. Borawski, Bethany Bell, Darcy Freedman. Reimagining the food desert in urban settings. American Public Health Association Conference. October 2016. Denver, CO.
Erika Hood, Briana McIntosh, Maleka Embry, Delores Collins, Don Slocum, Peter Whitt, Anna Thornton, Kakul Joshi, Erika S. Trapl. Creating Greater Destinies: Lessons learned from a resident driven approach to improve health, increase opportunity and strengthen community. American Public Health Association Conference. October 2016. Denver, CO.
Kakul Joshi, Samantha Smith, Shari Bolen, Amanda Osborne, Chelsea Hoch, Anna Thornton, Briana Mcintosh, Erika Hood, Maleka Embry, Michele Benko, Erika S. Trapl. Produce prescriptions for food insecure patients with hypertension in safety net clinics: A clinical-community linkage. American Public Health Association Conference. October 2016. Denver, CO.
Selam Shah, Scott Frank, Laura Santurri, Katarina Gardner. Perceptions of Public Health in Popular Culture. American Public Health Association Conference. October 2016. Denver, CO.
Scott Frank, Mel Rowe. Building a Pop Culture of Health Website. American Public Health Association Conference. October 2016. Denver, CO.
Erika S. Trapl, Craig S. Fryer, Qiao Mu, Jean Frank. Situational smoking behavior and product acquisition among adolescent multi-tobacco users of cigarettes and cigars, cigarillos, and little cigars. American Public Health Association Conference. October 2016. Denver, CO.
Allison Parsons, Madalena Monteban, Eunlye Lee, Pat Bebo, Ana Claudia Zubieta, Dan Remley, Carol Smathers, Ashley Davis, Sarah Ginnetti, Andrew Wapner, Julie Hewitt, Jarrod Dalton, David Ngendahimana, Darcy Freedman. Examining Readiness to Implement Nutrition-related Policy, Systems, and Environmental Interventions in Childcare Settings. American Public Health Association Conference. October 2016. Denver, CO.
Monteban, M; Freedman, D; Matlack, K; Jennings, E; Walsh, C; Bess, K. Mapping Food Networks and Habits among SNAP Recipients. International Network for Society Network Analysis. April 2016. Newport Beach, CA. Joshi, K., Smith, S., Trapl, E., Bolen, S. Implementing a Clinic-Community Partnership to Promote Fruit and Vegetable Consumption among Food Insecure Patients with Hypertension in Safety Net Clinics. Society of General Internal Medicine. Hollywood, FL. May 2016. Joshi, K, Smith, S, Trapl, E, Bolen, S. Implementing a Clinic-Community Partnership to Promote Fruit and Vegetable Consumption among Food Insecure Patients with Hypertension in Safety Net Clinics. CWRU Research ShowCASE, Cleveland, OH. April 2016. Manuel, L, Matlack, K, Monteban, M, Freedman, D. Exploring Social Network Density Related to Food Habits among People Receiving Food Assistance Benefits. CWRU Research ShowCASE, Cleveland, OH. April 2016. Thornton, A, Lever, J, Bolen, S, FallCreek, S, Borawski, E. Implementing the Use of Electronic Health Record Referral for Clinic to Community Linkage in Safety Net Clinics: Chronic Disease Self-Management Program Lessons Learned. CWRU Research ShowCASE, Cleveland, OH. April 2016. Pike, S, Rouse, C, Sehgal, A, Trapl, E, Borawski, E, & Freedman, D. Food Retail Options Available in Walking Distance of a Food Desert. CWRU Research ShowCASE, Cleveland, OH. April 2016. Thornton, A, Lever, J, Bolen, S, FallCreek, S, Borawski, E. Implementing the Use of Electronic Health Record Referral for Clinic to Community Linkage in Safety Net Clinics: Chronic Disease Self-Management Program Lessons Learned. Better Health Partnership Learning Collaborative Summit, Cleveland, OH. April 2016. Joshi, K, Smith, S, Trapl, E, Bolen, S. Implementing a Clinic-Community Partnership to Promote Fruit and Vegetable Consumption among Food Insecure Patients with Hypertension in Safety Net Clinics. Better Health Partnership Learning Collaborative Summit, Cleveland, OH. April 2016. Freedman, D.A., Flocke, S., Lee, E.E., Matlack, K., Trapl, E., Ohri-Vachaspati, P., Taggart, M., Borawski, E. Examining the reach of a multi-component farmers’ market implementation approach among low-income consumers in an urban context. Oral presentation at the 8th Annual Conference on the Science of Dissemination and Implementation in Health, Washington, DC. December 2015. Freedman, D Rouse, C; Flocke, S; Trapl, E.S. ; Matlack, K; Taggart, M; and Borawski, E. Translating Evidence into Policies and Practices to Promote Farmers' Market Demand among Low-Income Consumers. American Public Health Conference, Chicago, IL. November 2015. Freedman, D; Taggart, M; Matlack, K; Borawski, E; Bharwani, S*. Using Environmental Surveillance to Increase Access to Water in Schools. American Public Health Conference, Chicago, IL. November 2015. Joshi, K. Produce Prescription Project in Cuyahoga County. Greater Cleveland Academy of Nutrition and Dietetics, Cleveland, OH. September 2015. Trapl, E.S. Healthy Eating and Active Living sub-committee, featured speaker. Health Improvement Partnership (HIP)-Cuyahoga Community Health Improvement Plan launch, Cleveland, OH. June 2015. Trapl, E.S. Corner Store Visits and Cigar, Cigarillo, and Little Cigar (CCLC) Use Among Middle School Adolescents. American Academy of Health Behavior meeting, San Antonio, TX. May 2015. Olaisen, R. Social and Contextual Influences of Adolescent Sleep. American Academy of Health Behavior meeting, San Antonio, TX. May 2015. Trapl, Erika. Update from Healthy Eating, Active Living sub-committee of HIP-Cuyahoga. City of Cleveland Health & Human Services Committee, Cleveland, OH. May 2015. Trapl, E.S. Produce Prescription: Collaboration to Improve Fruit and Vegetable Consumption among Low-Income Pregnant Women. University of Akron Nutrition and Dietetics Advisory Board, Webinar. April 2015. Freedman, D.A. FM Tracks training for farmers' market managers participating in FreshLink and O-NOPREN. OSU Extension, Cuyahoga. April 2015. Freedman, D.A. ; Vaudrin, N. FreshLink Literature Review. Ohio Farmers Market Conference, Dublin, OH. March 2015. Freedman, D.A. FM Tracks: A tool for improving health food incentive program operations. Ohio Farmers Market Conference, Dublin, OH. March 2015. Freedman, DA. Developing, Implementing and Sustaining a Food Assistance Incentive Program for Farmers’ Markets: Lessons Learned in South Carolina. UNCA’s Key Center Social Justice Coffee Hour series, UNC Asheville. March 2015. Vaudrin, Nicole. Barriers and Facilitators to Farmers' Market Participation. Ohio Farmers Market Conference, Dublin, OH. March 2015. Trapl, E.S. ; Patrick, A.; and Taggart, M. Produce Prescription Program. PRCHN Seminar Series, Cleveland, OH. February 2015. Trapl, E.S. and Patrick, A. Produce Prescription Program. Association of Maternal and Child Health Professionals, Cleveland, OH. January 2015. Freedman, D. Developing, Implementing and Sustaining Healthy Food Incentive Programs at Farmers' Markets. Sponsored by Creating Healthier Communities, Community of Practice, USDA extension. National webinar. January 2015. Frank, J., Kinsella, A. A Call to Action: Recognizing and Responding to Depressive Symptoms in Adolescents. Ohio Adolescent Health Partnership Summit, Columbus, OH. November 2015. PRCHN Director Elaine Borawski, PhD, Associate Director Erika Trapl, PhD, and graduate student Rho Olaisen attended the American Academy of Health Behavior meeting in San Antonio, Texas, March 15-18, 2015. 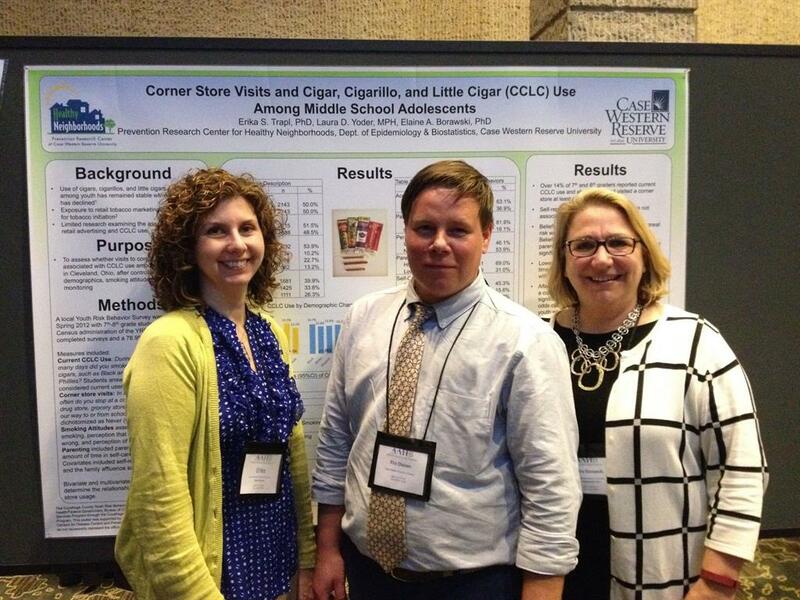 Dr. Trapl presented a poster around her research on little cigar use among middle school students. Olaisen presented a poster on the social and context influences of adolescent sleep. In addition, Dr. Trapl was elected Secretary of the AABH. Associate Director Erika Trapl, PhD, presented a poster at the Society for Research on Nicotine and Tobacco (SRNT) Annual Meeting February 25-28, 2015, in Philadelphia. Borawski, E.A., Moore, S., Trapl, E.S., Yoder, L., Jones, S. IMPACT: A Multi-Level Behavioral Intervention Trial for Middle School Urban Youth. (2014, November). Presentation at the 142nd annual meeting of the American Public Health Association, New Orleans, LA. Alison Patrick, Cuyahoga County Board of Health, and Associate Director Erika Trapl, PhD, presented on the Produce Prescription Program at the Association of Maternal and Child Health Professionals on January 27. Associate Director Darcy Freedman, PhD, conducted a national webinar titled “Developing, Implementing & Sustaining Healthy Food Incentive Programs at Farmers’ Markets” on January 29. The webinar was sponsored by the Creating Healthier Communities, Community of Practice extension. *Smallwood, S., Pitner, R., Freedman, D., Sharpe, P., Cole, J.A., & Hastie, S. (2014, November). Developing and implementing a Community Empowerment Center to build local capacity for community-level change. Roundtable presentation at the 142nd annual meeting of the American Public Health Association, New Orleans, LA. Weaver, R.G., Ajja, R., Chandler, J., Tilley, F., Kyryliuk, B., Beets, M.W., Huberty, J., Turner-McGrievy, G., Ward, D.S., Freedman, D. (2014, November). Are afterschool program environments supportive of children's moderate-to-vigorous physical activity? Poster presentation at the 142nd annual meeting of the American Public Health Association, New Orleans, LA. Trapl, E.S., Yoder, L.D., Borawski, E.A. (2014 November). Corner Store Visits and Cigar, Cigarillo, and Little Cigar (CCLC) Use Among Middle School Adolescents. Poster presentation at the 142nd annual meeting of the American Public Health Association, New Orleans, LA. Jewett-Tennant, J., Patrick, A. PEER: Research Capacity Building in Community Organizations. American Public Health Association Annual Meeting. Boston, Massachusetts, November 2013. Borawski E., Wapner, A. Introduction to Evidence Based Public Health. Ohio Combined Public Health Conference. Columbus, Ohio. May 2013. Flocke SA, Step MM. A teachable moment communication process intervention for smoking cessation. Poster Presentation, Society for Behavioral Medicine, San Francisco CA. March 2013. O’Rourke-Suchoff D, Yoder L, Trapl E. Adolescent acquisition and situational use of little cigars and cigarettes in Cuyahoga County. Ohio Public Health Association Meeting. Columbus, OH. May 2013. Trapl ES, Kofron R, Borawski E. iPads vs. Acers: Choosing a tablet computer for health behavior data collection. Technology demonstration at the 12th Annual Meeting of the American Academy of Health Behavior, March 19, 2012. Kofron R, Trapl, E.S., Borawski, E.A. Using smartpen technology for qualitative data collection. Technology demonstration, 12th Annual Meeting of the American Academy of Health Behavior, March 19, 2012. Borawski, E., Bruckman, D. Healthy Cleveland Initiatives: What is our Starting Point (a community health snapshot)" Keynote Presentation. Healthy Cleveland Inaugural Meeting, May 11, 2012. Borawski, E. Using Location-Based Health Surveillance Data to Provide Context for Understanding and Addressing Health Risk Behavior and Chronic Disease Outcomes. Oral Presentation. CWRU/Ohio Department of Health Data Symposium, August 30, 2012. Flocke, SA Teachable moments for health behavior change in primary care. Plenary presentation. Cancer and Primary Care Research International Network annual conference. June 2012, Cleveland, Ohio. Trapl E, Yoder LD, Cofie L, Matloub J, Burrell III L, Shaw N. Freak’em, Blunt’em, & Smoke’em: Adolescent use of modified cigar products. Presented at the 140th Annual Meeting of the American Public Health Association, San Francisco, CA, October 30, 2012. Link H, Knight K, Frank S. Who is Pregnant? Understanding social determinants of health, sexual health, behavioral risk and health outcomes among adolescent girls who have experienced pregnancy. Presented at the 140th Annual Meeting of the American Public Health Association, San Francisco, CA, October 30, 2012. Flocke, SA Teachable moments for health behavior change and intermediate patient outcomes. Poster Presentation. American Society for Preventive Oncology, Washington DC. March 2012. Trapl ES, Borawski E, Colabianchi N, Litaker D, Taylor HG. Impact of Audio-Enhancement and Electronic Format on Adolescent Survey Responses: A Comparitive Study. Presented at the 12th Annual Meeting of the American Academy of Health Beahvior, Austin, TX, March 20, 2012. Boutry M, Trapl, E, Kelly S. A Health Literacy Initiative: Development and Implementation of a Peer-coached Support Group for Inner-city Population. 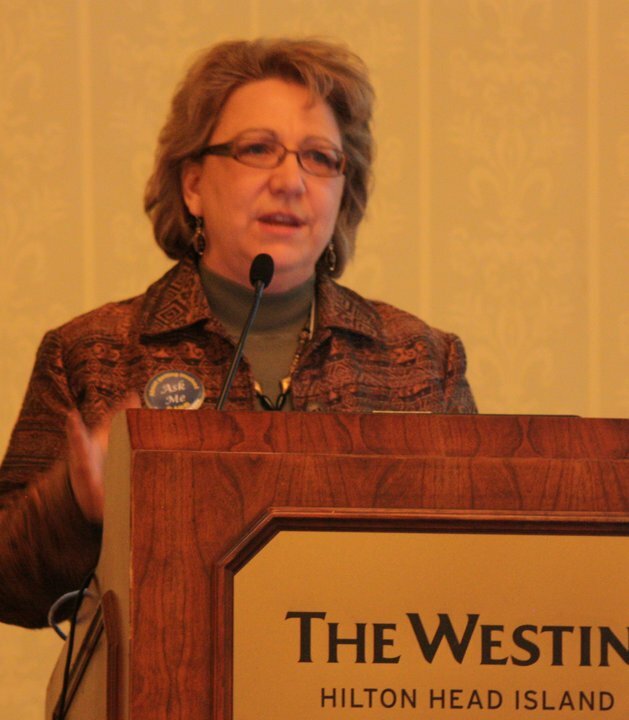 Presented at the Future of Pediatrics Conference, July 2011, Chicago. Borawski, E. With Health, Place Matters: Stories from our own Backyard. Invited Speaker. Kent State University School of Public Health. Kent, Ohio. April 26, 2011. Borawski, E. It Takes a Village to Raise a Healthy (or Unhealthy) Individual. Dialogue on Discovery Symposium, Case Western Reserve University, Cleveland, Ohio. Sept 23, 2011. Danosky L, Cofie L, Trapl, ES, Shaw N, Brackett P. From snus to hookah: Other tobacco products in the next generation. Presented at the 139th Annual Meeting of the American Public Health Association, Washington DC, November 1, 2011. Tramble T, Dumski H, Halko M, King B, Flocke, S, Matloub J, Trapl, E, Borawski, E. Development and Launching of PRC Research Working Groups as a Mechanism for Encouraging New Partnered Research. Prevention Research Centers 2011 Annual Conference, Atlanta, Georgia. April 12, 2011. Kelley-Moore J, Schneider C, Tate T, Taggart M, Meaney D, Melnick L, Mikebank K, Borawski E. Characterizing the Neighborhood Food Environment: A Mixed Methods Approach. Prevention Research Centers 2011 Annual Conference, Atlanta, Georgia. April 12, 2011. Borawski, E., Taylor, T., Kofron, R., Danosky, L., Estes, M., Brackett, P. & Aloshon, D.. We Run This City Youth Marathon Program: A School-Community Fitness Program That is Making a Difference. Poster Presentation at the American Academy of Health Behavior 11th Annual Meeting, Hilton Head, South Carolina. March 2011. Trapl ES, Cofie L, Danosky L. Use of brand examples in measurement of adolescent cigar use. Presented at American Academy of Health Behavior 11th Annual Meeting, Hilton Head, South Carolina. March 2011. Flocke, SA Patient Preferences and receipt of information for colorectal cancer screening. Paper presentation, Panel leader.North American Primary Care Research Group. Seattle Washington, November 2010. Borawski, E., Taylor, T., Kofron, R., Danosky, L., Estes, M., Brackett, P. & Aloshon, D.. We Run This City: A School-Community Fitness Program for Underserved Youth. Paper presentation. American Public Health Association Annual Meeting, Denver, Colorado, November 2010. Flocke, SA 'Teachable moments for health behavior change'. Poster Presentation. North American Primary Care Research Group, Banff Canada, November 2010.